It’s a common question, and the answer to it comes as a surprise to many. Being totally disabled may sound like you would have to be completely bedridden or in a vegetative state. This, however, is not the case. The legal definition of total disability as it relates to disability benefits and insurance is more reasonable than you might expect. The specific details of what is considered total disability will vary depending on your disability insurance plan. Your plan will define your entitlement to disability benefits based on your ability to perform work either in your job, your field, or the labour force in general. While the specific parameters of what it means to be totally disabled will vary from one policy to the next, it generally means that you are unable to reasonably perform the regular functions of your usual job. 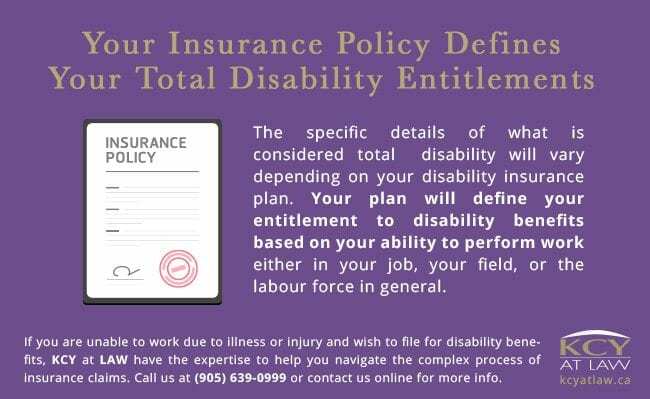 However, depending on your insurance policy’s total disability definition, your ability to perform work other than the job you were doing at the time you became ill or injured may impact your benefit entitlements. Some policies only require that you be unable to do your specific job in order to be considered totally disabled. Others, by contrast, may require that you be unable to perform other work – even if it is outside your field of interest or expertise – in order to qualify for total disability benefits. All insurance policies, however, will require that you receive the appropriate care from a qualified physician in order to qualify for total disability benefits. 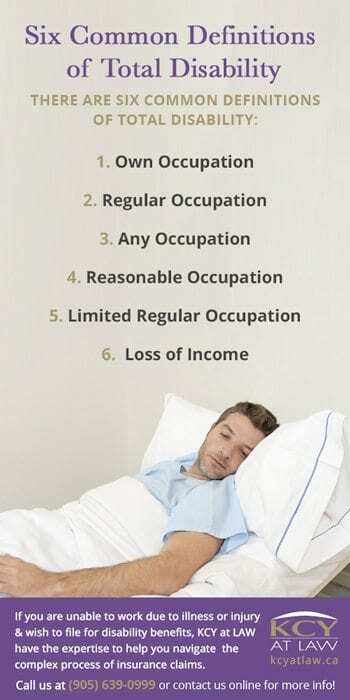 This definition of total disability requires that, directly because of injury or illness, you are unable to perform the important duties of your occupation. Own occupation looks at your ability to perform your specific job duties. Being able to perform other tasks does not disqualify you from receiving benefits. This is the most generous definition of total disability. Policies that define total disability in terms of own occupation are also the most expensive. They tend be available only to individuals at the top of their occupational field such as CEOs or specialized surgeons. The regular occupation definition of total disability is the most common definition offered in insurance policies. It is similar to own occupation except that it is broader in the types of employment you may have to pursue. Being unable to perform the specific duties of your occupation alone does not entitle you to total disability insurance benefits. However, you would not be expected to take on employment unsuited to your skill and education level. For example, an injured industrial electrician would not be required to take on a job as a cashier but may be required to find employment as an electrician in another, less physically-demanding sector of the industry. This definition of total definition is the least liberal but also the least expensive. To qualify for total disability benefits under this definition, you would have to be unable to perform gainful employment in any occupation for which you are reasonably qualified based on your education, training and experience. This definition is similar, but slightly more liberal, than the any occupation definition of total disability. It includes any occupation for which you may reasonably become qualified through education, training and experience. This definition protects you on the basis of the regular occupation definition of total disability for the first 24 months of your injury or illness. Thereafter, your coverage shifts to the any occupation definition of total disability. Loss of income definitions of disability do not define total disability in terms of your ability to perform a job. Instead, they pay benefits based on your loss of income due to illness or injury. For example, if you are completely unable to work and earn any income, you will receive the full benefit. However, if you are able to work somewhat, the insurance will supplement a percent of your lost income. If you are unable to work due to illness or injury and wish to file for disability benefits, KCY at LAW have the expertise to help you navigate the complex process of insurance claims. Call us at (905) 639-0999 or contact us online here.